From birthdays to anniversaries and graduations to baby showers our cakes have been there to help you celebrate your biggest milestones. With chocolate and vanilla being past favorites, we have added a new flavor that will add a burst of color to any celebration. Introducing the new Superfetti cake! Baked fresh in our bakery, this cake has subtle hints of marshmallow and vanilla flavor with a pop of vibrant color. If you are ready to enjoy a Superfetti cake for your next occasion, you can order online or in our stores. 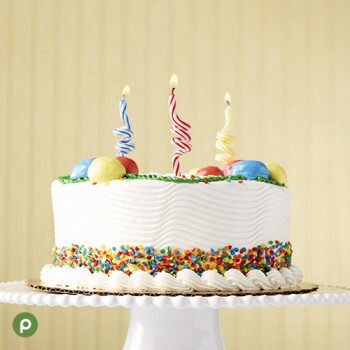 Before you place your order, feel free to visit your local Publix Bakery and talk to one of our experienced decorators or contact an event planner located at a store near you. They’ll help select the perfect size, decide on the right design and colors and answer any questions you may have. If you don’t need a whole cake, don’t worry! This cake is available by the slice as well. We look forward to making your next celebration cake for you. Share your photos with us on Facebook, Instagram, or Twitter.